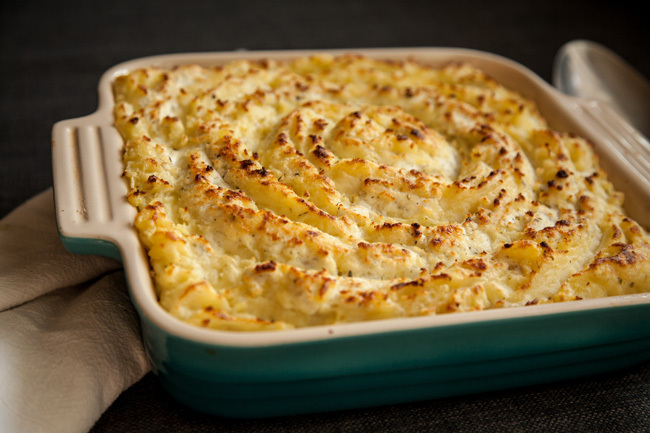 I love potatoes, but I never really spent much time perfecting the classic mash. 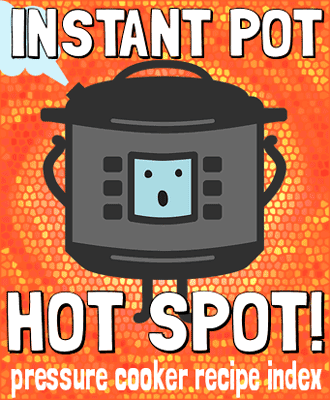 That is, until I got into pressure cooking with my Instant Pot (not sponsored, I just can’t get enough of this thing!). It eliminates the hassle of peeling, chopping and standing watch over the boiling pot, so the whole dish comes together almost effortlessly. And with all that saved work, there’s time to take an extra step to gild the lily with a perfectly swirled, crisp and golden top for that holiday wow-factor to make your guests swoon. This dish gets most of its flavor from the goat cheese, which keeps things rich and luxurious without relying on loads of cream and butter like other recipes. Just plenty of straight-up potato goodness- which includes lots of potassium and vitamin C, so don’t dismiss the tasty tuber as nutritionally bankrupt! I’ll keep it short and sweet because the big day is RIGHT around the corner… less talking, more mashing! Happy turkey day everyone!! Add whole potatoes and 1 Tbsp. salt to Instant Pot and enough water to cover them halfway. Close the lid with the valve in sealing position, select Manual mode, and adjust the cooking time to 20 minutes under high pressure. After the cooking time is up, turn off the warming function and allow pressure to release naturally. When the pressure releases, open the lid, drain the potatoes, and add them back into the Instant Pot. If desired, you can slip the skins off of the potatoes at this point. Add the milk, sour cream, butter and 3/4 of the goat cheese, and mash well with a potato masher until smooth. Transfer the mashed potatoes to a 8-inch baking dish. 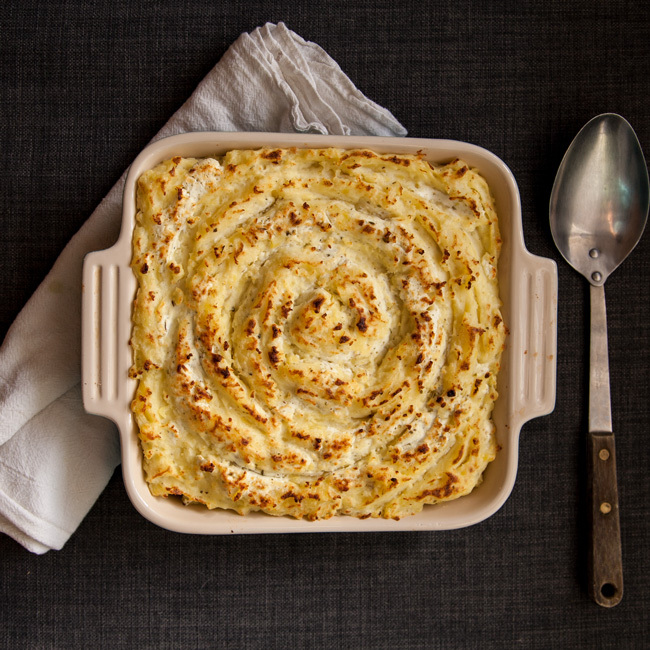 Top with dollops of the remaining goat cheese and use a spoon or spatula to create a swirled pattern. Cook the dish under the broiler for about 5 minutes, until golden brown. Peel the potatoes first if desired, then roughly chop into 3/4" chunks. Add the potatoes and 1 Tbsp. salt to a large pot of water and bring it to a boil, cooking for 20-25 minutes until very tender. Drain the potatoes and add them back into the pot. Add the milk, sour cream, butter and 3/4 of the goat cheese, and mash well with a potato masher until smooth. Yum! I LOVE goat cheese. I added some to my last batch of mashed potatoes and it was delicious. For me, I am all about the traditional Thanksgiving food– with a tinyyy bit of change 🙂 Turkey, stuffing, green bean casserole, and my Oma’s traditional cucumber salad are my favs! I know what you mean… T-day comes but once a year, so we gotta honor the classics! !